My first nagging thought was Chris Pine…hmmm Chris Pine….oh yeah Captain Kirk from Star Trek! Denzel is a bit like Elvis these days. He needs no introduction or explanation. You know he will deliver. And did he ever. Morgan Freeman did not even need to show up in this non-stop thriller. A couple of buffoon train keepers let a train take off under full power from a Stanton, Pennsylvania rail yard. No one is on board. They had neglected to set the automatic braking connections. So trains the size of the Chrysler building that carry millions of tons of toxic chemicals through our backyards have no remote controls? No remote cameras? Railroads rely upon country hicks in pick up trucks to know where they are? No one thought this could ever happen? Oh Really? TMG thought only the Federal government could be this stupid. This movie is based upon a real incident of a runaway train in 2001. So it apparently can happen. According to most of the time accurate Wikipedia, the film is inspired by the “Crazy Eights” unmanned train incident. The train, left its Walbridge, Ohio, rail yard and began a 66-mile journey through northwest Ohio with no one at the controls, after the engineer got out of the originally slow-moving train to correctly line a switch. He mistakenly believed he had properly set the train’s dynamic braking system, much like his counterpart in the movie did. Denzel as the old hand engineer and the new guy Pine quickly realize the fate of Scranton Pennsylvania hangs on their determination to stop the runaway train. Denzel uses his seat of the pants experience to assess the dynamics the corporate types seem clueless to resolve. The banter between Denzel and Pine is not award winning, but it fits and is fun. The whole script for that matter is a bit tried, true and predictable but you won’t care. The filming is awesome even though the heroics are far fetched. So what? Incredible sound and rushing freight trains almost take your breath away. 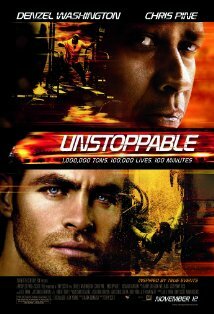 Unstoppable is everything a big Hollywood movie is supposed to be. It is a fun and thrilling ride I would take over and over again.